Mark Grossman: What is a “Blood Moon”? Grossman: A Different Flavor – Just How Smart Are Octopuses? Mark Grossman – Toy Robot Spiders — the Real Things Weren’t Enough? Mark Grossman — What is Bionics? Grossmann: Bees Seek New Careers – Tired of Sweat-Shop Apiaries and CCD? The fate of bees, generally, is a matter of great concern these days. Bee populations throughout the world, and particularly in the United States and Europe, are dropping rapidly and mysteriously. Without the bees’ unique service as pollinators, the value of yearly agriculture output would drop by billions of dollars. Without bees, our food supply would plummet and a good portion of the people on earth would begin to starve – quickly. The problem has a name CCD, Colony Collapse Disorder, but no one is sure what it is. The best guess is that bees are weakened by a variety of factors until their immune systems collapse. Then, they contract, and are killed, by an unrelated disease, leaving researchers to trace back through the maze to the root cause or causes. But let’s look at the world from the bee’s perspective. What is it like to live a bee’s life? Right now, a terrible plague, CCD, is hanging over bee populations all over the world. And what would the surviving bees say, if asked about their daily life? Well, I think it would go something like this. Interviewer: What is it like to work as a pollinator, Ms. Bee? Bee: Work! We aren’t worker-bees anymore! We’re slaves being worked to death. Interviewer: I don’t understand. Don’t you live out in nature. Living and working as you have for thousands of years? Bee: Natural bee’s life! Not even close! First, we’re fed chemicals to make us more active during pollination season. It’s like the stuff they give to athletes before competition. We don’t recover until about 3 months after the pollination season is over. And, during pollination season, we’re trucked hundreds of miles on bumpy roads 24-hours a day so we can’t sleep. And we don’t get any food. They’re afraid we won’t be aggressive enough pollinators unless were starving. Interviewer: Yes, but when you get to the fields, you get to chow down . . . ? Bee: What?! They release twice as many bees into those fields as are needed to pollinate the available blossoms. That’s so they can make sure every blossom gets pollinated. So, most of us get hardly anything to eat. And, we were starving already. Interviewer: But, then, they feed you. Bee: No. Then, they starve us for another day — so we’ll be “aggressive” about gathering honey. Remember? No wonder we’re dropping like flies. Like I said, it takes months for us to recover after the big pollination season. The only time we get to eat is when we’re resting off-season. After a few years of this . . . Let’s just say I wouldn’t cry if I never saw a blossom again. Interviewer: [cautiously] I want to ask you about . . . pesticides. Bee: Pesticides! Don’t even get me started about pesticides! A bee’s life? If I had these working conditions, I’d look for a new career. I’m sure many honeybees fall victim to CCD yearly. But the more I hear about the honeybees’ life in the hive, the more I wonder if some are sneaking away to alternative careers to escape the sweatshop conditions of employment as a “pollinator.” Honeybee’s have something going for them. After thousands of years of smelling flowers, they’ve got good noses . . . . TRAIN FAST FOR A NEW CAREER IN HEALTHCARE: DIAGONOTICS. I can imagine honeybees buzzing around windows and ducking into homes and libraries to catch a look at the internet hoping to see one of those ads, “A Career in Health Care – Train in less than . . . 10 minutes? !” Yes, learn advanced medical diagnostics, for bees, in less than 10 minutes. What can you expect to learn to diagnose? Tuberculosis, lung, skin and pancreatic cancer. However, there is one catch. You must be a honeybee, Apis mellifera! Other species need not apply. What’s so special about these bees? They have an unbelievably acute sense of smell. They can detect airborne molecules in the parts-per-trillion range. What does that mean? Well, let’s just say this puts “sniffer dogs” to shame. But what does smell have to do with diagnosing diseases? Do people with certain diseases smell? No! But their breath carries an odor that indicates the presence of certain diseases. Technically called “biomarkers” these chemical odors are associated with specific diseases. Odors that honeybees can detect. The training takes about 10 minutes. The bees are exposed to a biomarker odor associated with a particular disease. With each exposure they are fed a solution of water and sugar until they associate the odor with the reward. The answer. The 10 minute training will last for life. Of course, your employer has to keep your skills sharp by rewarding you with water and sugar repeatedly. And everyone’s wondering why bees leave their hives and don’t come back. The DEA may be planning to use bees for security-related activities. “Security-related activities?” Yes, bees may be rapidly replacing those clumsy flea-bitten beasts on four legs — drug-sniffing dogs. Remember a bee’s nose put’s the canine sniffer to shame. A small hive of honeybees is easier to carry and care for than those hounds with their endless vaccinations, flea powder, and licensing requirements. What working conditions can the bees expect? The same cushy conditions as those in medical diagnostics: Job security with constant rewards in the form of food – water and sugar. 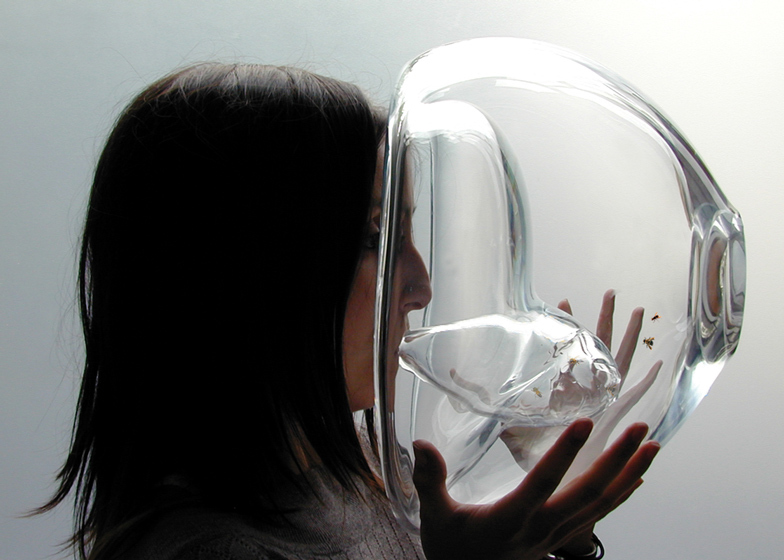 But, instead of a glass jar, these bees work in a box. What do they do in the box. The same thing they did in the jar. It’s all about the bee’s amazing sense of smell. Again, remember those noses. The bees don’t even have to leave home, but live in a mobile home or, rather, a box. When air is blown through their “buzz box,” their responsive behavior alerts officers to the presence of drugs. The box works on the same principle as the glass jar in medical diagnostics. 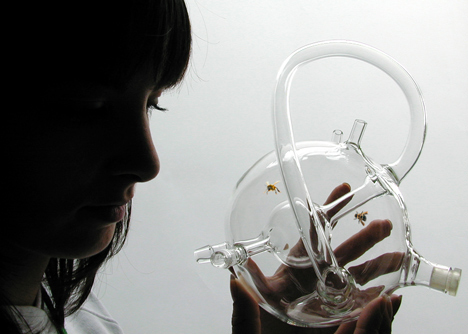 The bees are trained to recognize the smell of a particular drug through rewards. When the air blows through the box, if the smell of contraband is detected, the bees react. But the buzz box is an especially easy gig – the bees don’t even have to fly. All they have to do is stick their tongues out. The users will recognize this, not as a sign of disrespect, but as preparation for meal as the bees associate the smell of drugs with a reward. As far back as 2006, researchers at the Rothamsted Research Centre in Hertfordshire, UK were testing the first prototype of the buzz box. It is being manufactured and marketed by Inscentinel a related company. Inscentinel’s General Manager, Rachael Carson, says that this technology could be used to detect more than drugs and might even be used to monitor food quality. But with research also emphasizing security-related applications, such as the detection of TNT, Semtex, gunpowder and other explosives, another related career will soon be open to our job-seeking honeybees. Remember the sign that used to say, “We’re looking for a few good dogs.” Well, the word “dogs” has been crossed out and “bees” written-in above it. The same buzz box in which bees detect the scent of drugs, works just as well with the scent of explosives. This opens a wide range of civilian and military careers to our career-switching bees. The “B Teams” (bee teams) in the buzz boxes are building an impressive test record detecting explosives hidden in shipments passing through busy cargo airports. The big losers here are the “former drug-sniffing” dogs. There may be a canine unemployment issue as man’s best friend starts pounding the pavement looking for work after losing out to the new, cheaper, and less care-intensive honeybee. A FEW GOOD BEES NEEDED FOR HUMANITARIAN DEMINING. Croatian researchers heard about the honeybee’s amazing nose and are, now, training bees to find unexploded landmines. About 750 square kilometers (466 square miles) of Croatia and the Balkans may still be filled with mines from the Balkan wars in the 1990’s. Nikola Kezic, a professor at Zagreb University and an expert on the behavior of honeybees, has proposed an experiment: Bees have an almost perfect sense of smell – one that can quickly detect the scent of explosives. Can the insect be trained through food rewards to detect the smell of TNT? TNT is the most frequent explosive used in the landmines. The problem is that the smell of TNT evaporates very quickly. Too quickly for dogs or rats to detect. (Yes, rats have been used in landmine detection.) However, neither of these animals have a nose anywhere near as sensitive as that of the honeybee. For these experiments, the bees will be trained by mixing a small quantity of TNT in with food — water and sugar. After the bees learn to associate the smell of TNT with food, they will be released into a field in which small quantities of TNT have been placed in various locations. If they can locate the TNT in the field, the bees should be able to smell the traces of TNT from a buried land mine. The Croatian researchers are optimistic about the early test results. And speaking of “humanitarian” applications, let’s not forget the welfare or our dogs (and, apparently, even our rats). This is one career that the dogs and rats will be happy to leave behind. Although dogs can, sometimes, sniff out land mines they are rather heavy animals. Weight on the surface of the ground — above a landmine — doesn’t promise anything good for the locating canine. If a particular dog is successful in locating landmines, it tends to enjoy a very short career. In contrast the bees remain airborne, and can not only detect TNT, but live to sniff another day. At least one bee researcher expressed dismay with all of these new careers for the honeybee. The fear is that putting honeybees in these unfamiliar boxes and jars could cause stress that would affect the insect’s performance. However, when you review the “unnatural” life of the modern “pollinating” honeybee, nothing about any of these new careers could be remotely stressful. So far, the bees seem to thoroughly enjoy the light work schedule and frequent rewards. I wouldn’t be surprised if, someday soon, the almond orchards of California will have a serious honeybee shortage. CCD? Sure. Bees are dying in record numbers. But, just maybe, more than a few are escaping to alternative careers with comfortable working conditions, generous benefits, and long term security. Maybe even bees know a “better deal” when they find it . . . or smell it.